During the winter and spring seasons backcountry trails may be impassible due to snow accumulation and fallen trees. Some trails remain open at lower elevations and may be passable for hiking, snow shoeing and cross country skiing. It is recommended that all trail users inquire at the ranger station prior to a trek. The links below provide specific information on trails in each area. Note that the US Forest Service seldom updates this data from October to March. As the snowpack melts throughout the spring, many higher elevation trails will again become accessible to hikers. In addition, certain designated trails are also available to mountain bikes, horses, and all terrain vehicles. 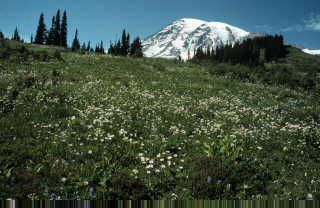 The United States Department of Agriculture through the US Forest Service is responsible for management of most federal forest land and oversees not only developed ski area use, but also wilderness areas and mountain trail use and maintenance. The following links provide access to trail use information and current trail conditions as compiled by the US Forest Service for the pacific northwest region. 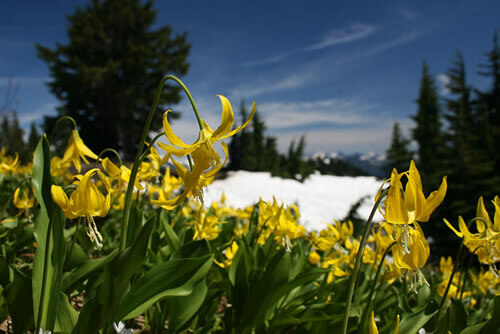 The National Park Service provides similar information for Mt Rainier and Crater Lake trails. Check the reports for recent dates to determine ease of access to trail heads and usability of trails. Trail Park Passes are now required year-round to park at developed trail heads at most forests. Trail Park Passes must be displayed in the windshield of all vehicles parked at or within 1/4 mile of designated trail heads. Passes are not available at the trail heads but must be purchased in advance at the ranger station or elsewhere. Day Passes cost $5.00. Annual Passes (good for the calendar year) cost $30.00. Click here for information on where to obtain trail passes. Photos courtesy of the US Forest Service and the National Park Service. 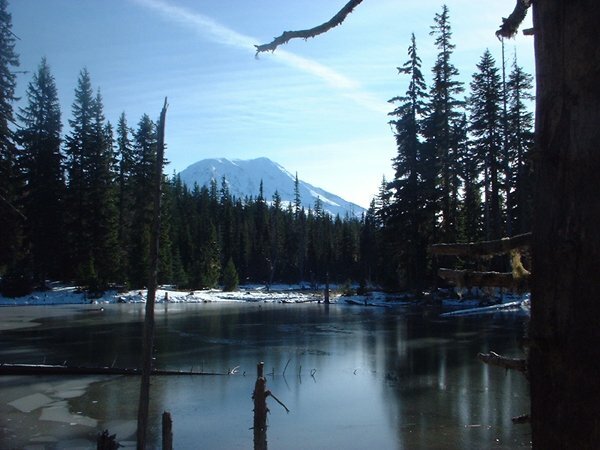 This page is the localsnow gateway for Northwest trail conditions, names and locations of hiking trials, mountain biking trails, Pacific northwest hikes, wilderness trails, and day hikes. It includes the major national forest areas, like Mt Baker-Snoqualmie National Forest, Gifford-Pinchot National Forest, Olympic National Forest, Mt Rainier National Park, Crater Lake National Park, Wenatchee National Forest, Okanogan National Forest, and the Coleville National Forest.